Cheyenne Owners: Enhance Your Investment! You have Made a substantial investment in the purchase of your Cheyenne. Upgrading it with a Pitot Cowling System and Aerodynamic Speed Stacks will enhance your investment and save you money! The costs of these upgrades will more than pay for themselves before the first hot section inspection, and they will continue paying dividends in improved performance, increased efficiency, greater safety, lower maintenance and lower hot section overhaul costs. Plus they increase the resale value of your Cheyenne. 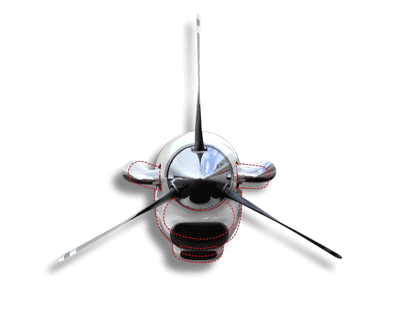 All aircraft manufacturers appreciate the advantages of an aerodynamically clean airframe. Over the years, the external shape of the fuselage, wings and cowlings have been changed and refined in a continuing effort to reduce drag and increase performance. In recent years, aeronautical engineers have given equal emphasis to the internal airflow (the airflow that enters the cowling inlet and passes through ducting into both of the engine intakes) of an airframe as an additional source of enhanced speed and efficiency. Aeronautical engineers gauge the aerodynamic efficiency of the cowling and ducting by measuring how well high velocity air at the cowling inlet is converted into static pressure around the engine’s inlet. This static pressure is generally expressed as a percentage of ram recovery. For instance, 100% ram recovery would indicate that 100% of the inlet air’s energy is converted into static pressure at the engine inlet. The higher the ram recovery percentage, the faster the aircraft will go. This is because at a given ITT, there is a finite amount of energy that can be produced by a turboprop engine, and this energy must be shared by the two power absorbing sections of the engine, namely the compressor section, which compresses air for combustion and the power section, which turns the propeller. By increasing the ram recovery to the engine inlet, less energy is used by the compressor section leaving more energy available to drive the propel. Noticeably, all later model Cheyennes are equipped with cowlings offering improved ram air recovery. Their performance in both climb and cruise is markedly improved over earlier models. Recognizing the performance improvements high ram air recovery offers, we developed an all new “Pitot Cowling System” specifically for the Cheyenne I, II & IIXL series aircraft not equipped at the factory with this powerful technology. Great care was taken in the design to minimize cost and facilitate ease of installation in the field. First, our aeronautical engineers analyzed the existing cowling system and identified the areas that needed improvement. Then we designed a new multicomponent air pressure recovery system combining; (1) a newly designed cowling inlet repositioned to maximize the recovery of the ram air velocity from the propeller, (2) computer designed aerodynamic inlet ducting to minimize air separation and flow losses, (3) fore and aft variable air flow deflectors and a fixed inlet turning vane which function together to direct and minimize flow losses in icing conditions, and (4) a positive air pressure seal system designed to prevent leakage. As a result of this new design, the amount of ram recovery dramatically increases in cruise, climb and during icing conditions. TAS is increased up to 15 knots without increasing engine ITT’s. 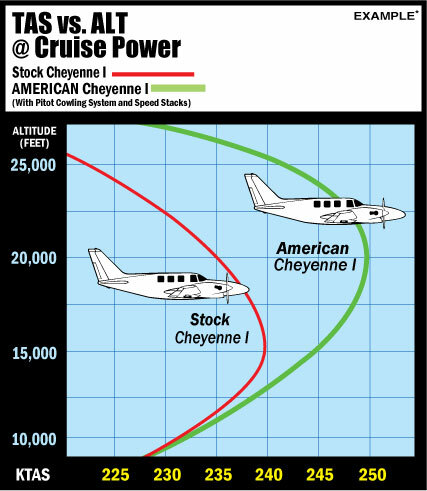 The aircraft’s critical altitude is increased approximately 3,000 feet with additional torque maintained throughout the remaining climb to altitude, resulting in reduced time to climb. In addition, performance is significantly increased during flight into visible moisture with ice doors deployed. Cheyenne exhaust pipes might appear as a source of excessive drag. Our analysis confirmed that the standard pipe shape is aerodynamically dirty and not properly aligned with the airflow.Our new Aerodynamic Speed Stacks are designed to reduce drag while keeping the aircraft cleaner. The original Cheyenne stack is actually the same exhaust used in four different positions in relation to the longitudinal axis of the aircraft, which creates a high drag profile. American Speed Stacks are manufactured as four distinct stacks with different flange hole locations for each position so they can be clocked to their most aerodynamically correct positions. Speed Stacks not only look sleek and fast, they are. As a result of the new shape, airspeeds are increased from 4 to 8 knots and the boundary layer relief is improved, meaning more exhaust residue will be blown clear of the airframe.